During the Assembly for Quality Basic Education in Kathmandu I had the possibility to play a bit with an interesting mini-computer designed for primary school education, the TeacherMate from Innovations for Learning (IfL), and to talk with Seth Weinberger, IfL Executive Director. Of all the computers designed specifically as personal educational devices, the TeacherMate has one of the lowest costs for end users, about 60 USD per unit. Several of its software applications also work on the XO laptops I saw at work in Nepal. 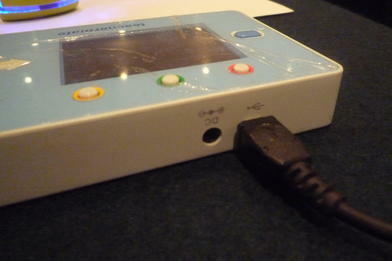 Hardware-wise, the Teachermate has a USB port for downloading software from the teacher’s computer, an SD card slot, a speaker and a microphone. The two last peripherals are particularly useful for learning foreign languages: students can listen to sentences spoken by native speakers, record themselves while repeating those sentences and then compare the two versions. The user interface consists of four arrow keys and four buttons of several colors. When you power it up, you get a menu which lists the available activities. 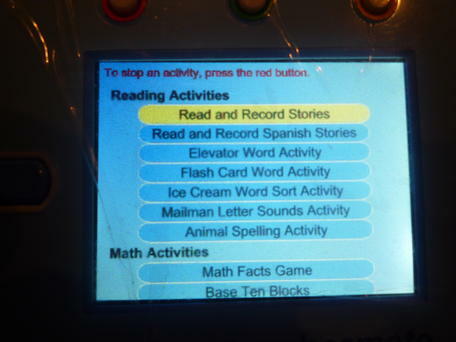 The unit I had contained, among others, programs to read and record Spanish stories, practice spelling, sort words and do a few math exercises. What’s the Teachermate place in the classroom? During the OLE Assembly, Seth explained that the Teachermate was not created to be used standalone, but to transform what happens inside the classroom, by integrating everything the children do with it with what the teacher is actually doing on her blackboard that day: everything a student does on a Teachermate is uploaded to the teacher’s computer, making it much easier to compare exercise results and keep track of everybody’s progresses. Since every student has an account, more children can share one TeacherMate. 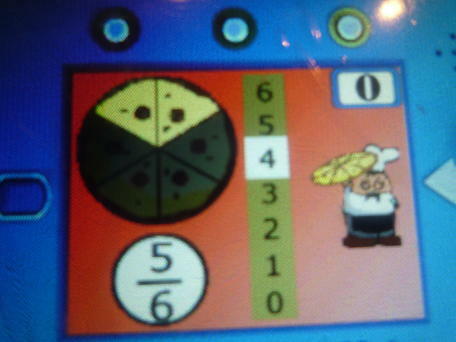 The management software also allow teachers to download into each Teachermate a different exercise or activity. This makes it possible to engage each child in the most productive way or to make him or her work in his/her native language. Back then, the XO laptops were still too expensive and not yet easily available in the USA. Therefore, Seth said, IfL asked Nintendo if they were interested in porting the TeacherMate software to their consoles, but they declined saying that their business was entertainment, not education. 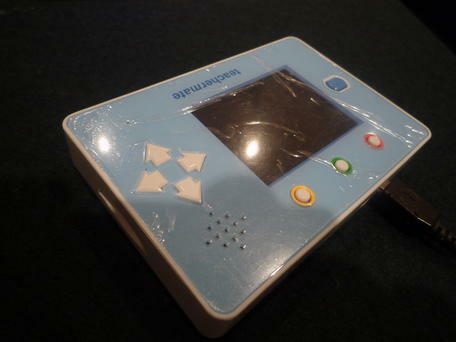 Now, what do you think of this, knowing that this year a School Edition DS was announced, or that Nintendo DS may be already used in Osaka schools? Personally, knowing how electronic waste becomes a bigger and bigger problem every year, it makes me sad to hear that people with a great idea are forced to build even more hardware than necessary to carry it on, but we digress. What do children and teachers think? 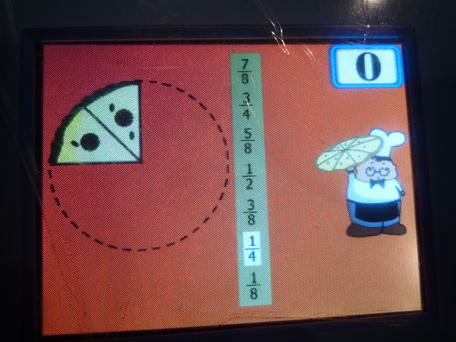 Finally, Seth was also surprised to discover that, while IfL “added all sorts of fun animations and rewards to the activities, to motivate students”, children often seem to ignore them and like the TeacherMate just because “it’s helping us learn to read and do math.”. Makes one think, doesn’t it?